The academic success of an institute depends on Research & Publications. 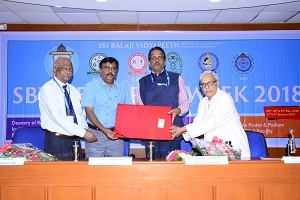 In Sri BalajiVidhyapeeth (SBV), the Deanery of Research organizes SBV Research Week every year to motivate Research and related activities among students and faculty and acknowledge them with rewards. Prof.Subhash Chandra Parija, Vice chancellor, SBV inaugurated the SBV Research Week 2018 on28th Dec 2018 at 9am. This was organized by the Scientific & Academic Fora (SAF) of the three constituent colleges of SBV under the aegis of Deanery of Research and was held at College Block, MGMCRI on 28th, 29th, 31st of December 2018, 2nd& 3rd January 2019. The programme included Intra & Inter-Collegiate Poster & Podium competition fortheUndergraduate, Postgraduate students and faculty of SBV. Students of Medicine, Dental, Nursing & Allied Health Sciences of SBV and other Health Institutes in Pondicherry actively participated in these categories. 118 postgraduates, 26 undergraduates and 10 faculty members participated in various events held during these 5 days. Prof S Ramkumar, Dean, Rajiv Gandhi Institute of Veterinary Education and Research, Pondicherry was the chief guest for the valedictory function held on 3rd Jan 2019 and distributed the cash awards to the winners. He appreciated the enthusiasm of the participants and the efforts of organisers in their moto to promote research. During this event faculty with good number and also with high quality of publications were acknowledged. Cash awards were also given to the guides and students, who have done the ICMR – Short term students projects for the year 2017. Prof Subhash Chandra Parija, Vice chancellor, SBV presided the Valedictory function. Prof C Adithan, Dean Research – SBV, Dr Tarun Kumar Dutta, President SAF, MGMCRI were also present.